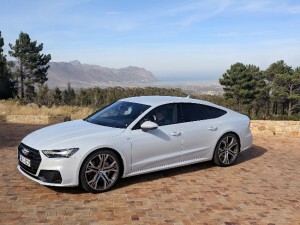 The all-new 2019 Audi A7 was revealed to the World’s press at an event in Cape Town, South Africa. A long way to go from Canada but a fitting backdrop for such a stunning vehicle. Redesigning the A7 must have been a stressful project for Audi’s head designer Marc Lichte. The first generation Audi A7 was one of the most celebrated designs in recent memory and with over 250,000 units sold, ranks as the most successful 4 door coupe model in the luxury segment. Designers gleefully pointed out the charms of the A7, with the sleek looks of a coupe, the comfort of a sedan, combined with the practicality of an Avant wagon. Aesthetically, Lichte has taken a scalpel to the rounded panels of the first generation model and sharpened the overall design. The front grille appears to sit lower and the distinctive front lights have a thinner and sharper profile. The overall design of the lights are all new also. Three options of front lighting include an LED based package as well as two Matrix LED arrangements, one of which incorporates Audi’s laser light technology. A new feature added to the lighting array is an animated sequence of striped lights that roll about when the vehicle is locked or unlocked. The bands of light can be seen in the attached photo. 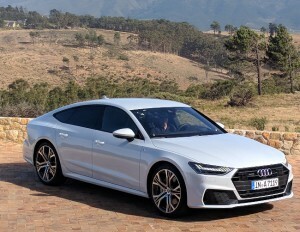 The new 2019 Audi A7 is the closest incarnation to the Prologue Concept shown in Los Angeles back in 2014. Beneath the restyled metal skin, the chassis is all new with an exotic blend of high strength, hot and cold formed steels, as well as other alloys and a small band of composite plastic along the rear section of the roofline. An additional 10% torsional rigidity provided by the new platform results in better handling and a quieter ride. The latter is partially due to improved glazing materials even despite the vehicle using frameless doors. The new A7 uses a longer wheelbase with a wider track, than the earlier model. The cabin size has been revised to provide rear seat passengers with 13mm extra legroom and 5mm extra headroom. According to Audi the new A7 will tote 535 litres of cargo in the rear, which increases to 1390L with the rear seats folded down. Any new Audi model presentation has always included the words lighter and more efficient. This time around the word “lighter” was notably absent. The new model comes standard with a mild hybrid system that has been borrowed from the flagship A8 sedan. This hybrid system uses a 48V electrical system that harvests and returns power (up to 12kW) through the starter motor and stores energy in an onboard lithium-ion battery. At speeds between 45-60 km/hr, the vehicle will return power to the drive train for up to 55 seconds. The system yields fuel savings of up to .7L/100 kms. When questioned, one engineer confirmed that the hybrid system, even with its additional weight, provided more fuel efficiency than simply shedding the weight of the additional electrical equipment. The initial gasoline engine offering for the Canadian market will for a 340HP 3.0L TSFI unit. With 500NM of torque, the 2019 Audi A7 will sprint from zero to 100 kms/hr in 5.3 seconds. Power is conveyed to the Quattro all-wheel-drive system through a 7 speed S-Tronic dual clutch transmission. Another feature borrowed from the A8 and Q7 models is Audi’s dynamic 4 wheel steering system. At speeds up to 60 kms/hr the front and rear wheels rotate in opposite directions, with the rear wheels being offset by up to 5 degrees. This results in a 1.1 metre reduction in the vehicle’s turning circle. At speeds over 60 kms/hr, the rear wheels move parallel to the front, resulting in an increase in high speed stability during lane changes. Inside the vehicle Audi has once again leaned toward the A8 flagship model to borrow technology and design elements. The dashboard is less monolithic and has stepped levels, with some edges highlighted with your choice of up to 30 colours of LED lighting. The ambient interior lighting is used on other surfaces also to follow and highlight cabin shapes and surfaces. The multi-function steering wheel also appears to have been conscripted from the range-topping A8 sedan. The centre piece of the A7 interior is the redesigned Audi Multi Media Interface, (MMI) first shown on the A8 sedan. A pair of LCD screens sit midpoint of the dashboard, above the centre console. Most mechanical controls have been moved to the digital screens. The top mounted screen measures 10.2 inches and the lower 8.6 inches. While early attempts at digital interface controls may have seemed cumbersome or clunky, Audi was always seemingly at the forefront of ergonomic leadership with previous MMI systems. The new interface is instantly logical with smartphone type controls. Being able to swipe, pinch and expand a NAV screen with your fingertips is as logical to most people at flicking a switch or turning a knob. The system also uses shortcut icons on the upper screen for the 5 most utilized features. Users are able to drag and drop functions to the favorites area, much the same way one would customize your smartphone home screen. Another innovation and one the engineers stressed was perhaps the most troublesome to perfect was the haptic (physical) feedback when occupants touched the screen to enter commands. Overall, the system is likely the pinnacle of driver/machine interface on the market today. Some features remain directly accessible outside the menus of the MMI system. Logically these include the rotary audio volume knob and the Audi Drive Select system which tailors the ride dynamics of the car based on the drivers preference. 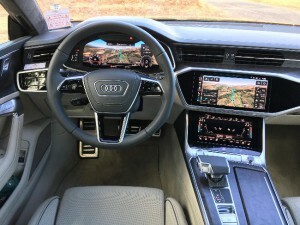 Audi has also acknowledged that the new A7 will provide a wider spread in driving dynamics between the comfort setting and the aggressive Sport mode. Internationally, the 2019 Audi A7 will come in 4 chassis configurations including options for magnetic dampers and an air suspension. All of the models we drove on the launch were equipped with the Air Suspension option. No model packing information has been released for Canadian spec models at this point. 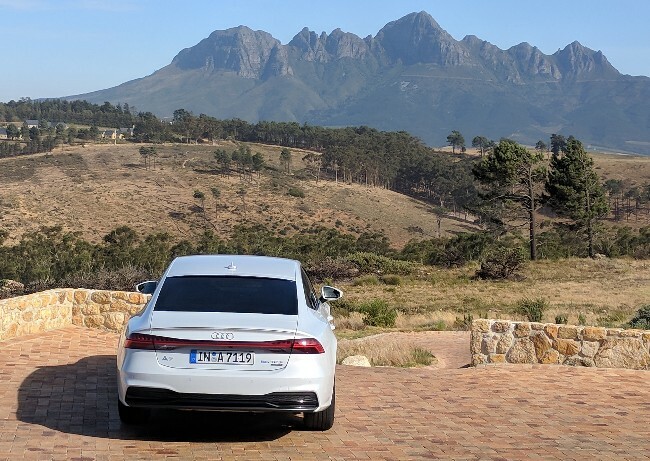 Improvements to the on road experience of the A7 were easily highlighted on the twisty coastal roads around the Western Cape area of South Africa. Pushing the A7 reveals that the already crisp handling of the current model has been enhanced. The 2019 Audi A7 presents as a far more nimble vehicle than the outgoing model. The bulk of the improvement feels due to the 4 wheel steering system. The quicker steering response and telegraphic handling made short work of tight, blind corners on raised mountain roads that hung high above the oceans surrounding the Cape Peninsula. Throttle response was as sharp as ever and the faster shifting S-Tronic gearbox, proved as smooth as any regular automatic transmission. Real world usage of the improved MMI system, especially in an environment where we were driving on the opposite side of the road to which we were accustomed, proved the increased efficiency and intuitiveness of the redesigned system. Audi sold large numbers of the first generation A7. The new model improves on a car that customers flocked to buy. 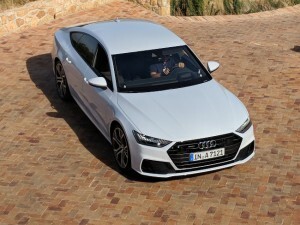 We can only expect the 2019 Audi A7 to remain the most popular model in the Luxury 4 door coupe segment, it certainly appears to be the best in class. Expect the 2019 Audi A7 to hit European showrooms in the second quarter of 2018 and arrive in Canadian dealer showrooms in the 3rd quarter of 2018.